This shield was issued in 1942 and worn by Volga Tartar volunteers. This arm shield shows a white crossed knife and arrow on a blue and green horizontal stripe background. The black border on top has the white inscription “IDEL-URAL.” The word “IDEL” in Tartar means Volga River. The Volga-Tatar Legion (German: Wolgatatarische Legion) or Legion Idel-Ural (Janalif: Idel-Ural Legionь) was a volunteer Wehrmacht unit composed of Muslim Volga Tatars, but also included other Idel-Ural peoples such as Bashkirs, Chuvashes, Mari people, Udmurt people, Mordva. In late 1942, the Nazis started forming what they called “national legions”. 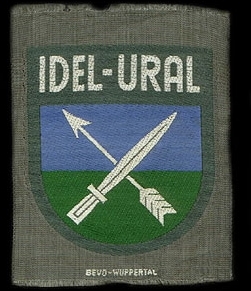 Among others, the Idel-Ural legion was formed in Jedlina, Poland, consisting of prisoners of war belonging to the nations of the Volga basin. Since the majority of the legion were Volga Tatars, the Germans usually called it the Volga-Tatar legion. The Nazis tried preparing the legionnaires for action against the Soviet Army in a chauvinistic and anti-Soviet fashion. 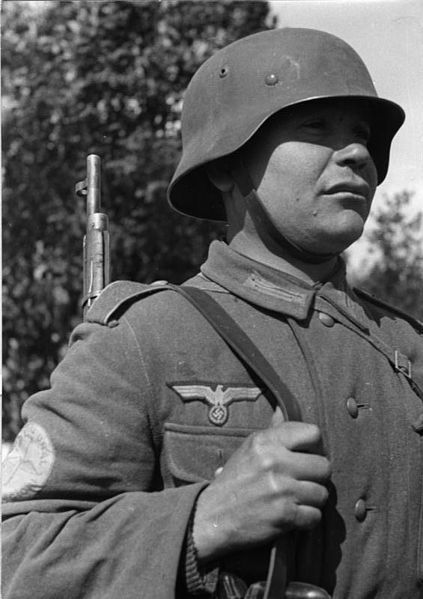 Musa Cälil joined the Wehrmacht propaganda unit for the legion under the false name of Gumeroff. Cälil’s group set out to wreck the Nazi plans, to convince the men to use the weapons they would be supplied with against the Nazis themselves. The members of the resistance group infiltrated the editorial board of the Idel-Ural newspaper the German command produced, and printed and circulated anti-fascist leaflets among the legionnaires into esoteric action groups consisting of five men each. The first battalion of the Volga-Tatar legion that was sent to the Eastern front mutinied, shot all the German officers there, and defected to the Soviet partisans in Belarus.